I would much rather make the acquaintance of the people who are actually growing and raising my food than suffer a distant, from-my-wallet-to-your-cashier relationship with a huge mega-supermarket conglomerate food chain. I am much more interested in supporting a local grower and seeing that my dollars go into his/her hands rather than having my food dollar pay for transportation, packaging, marketing and warehousing my food—all of which contributes to reducing the taste, freshness, safety and nutritional value of that food. For both experienced and budding cooks, preparing fresh, locally-grown foods has the big advantage of creating great taste without much effort. We’ve all probably had the experience of picking or buying fresh-picked corn on the cob at the height of its season in the summertime and taking it home and cooking it same day. Can’t get any sweeter! And we’ve all probably had the experience of buying same corn and storing it for a few days in the refrigerator and then tasting the disappointing starchy corn that results from letting it sit. No comparison. Fresh-picked corn wins! The same is true for all vegetables and other food products. When you buy it fresh and prepare it right away you have superior taste as well as superior nutritional value. That alone makes it easier to create incredibly delicious food without breaking a sweat. And I’m all about making my cooking life cooler and easier in the summertime! 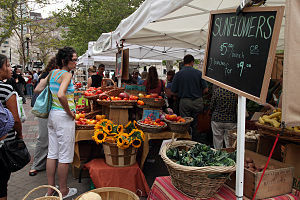 Do you frequent a farmer’s market? I’d love to hear what you find there and how you like it. This entry was posted in Food, Food Shopping, Health, Lifestyle and tagged buying foods in season, Farmers' market, fresh food, Local food, locally grown foods, preparing fresh produce, United States Department of Agriculture by mycookinglifebypatty. Bookmark the permalink. Hello and thanks for dropping by! The growing season must be pretty short there. Now you’ve got me curious as to what would be native to your area to eat. Coming over to visit your blog too. Hi Ms. Patty! I love shopping at Farmer’s Markets…when our garden isn’t producing, that is. Unfortunately, most of the markets that have good fresh organic food are miles & miles away. I just finished a three day spring fast eating mostly fruits & vegetables. Feeling really good! Hope all is well with you. Wow that fast sounds wonderful Kathy! All is well here and hope your hubby is recovering real well. He’s doing pretty well, Patty, thank you. Still has times of pain, but is progressing well in physical therapy. We’re going to start planting our onions and lettuces today.